The area between Diss and Attleborough is intensely agricultural. It's hard to imagine anyone buying a holiday cottage here, or a weekend home. Of course, a couple of hundred years ago this was a much busier place than it is today, and we couldn't have wandered the lanes without seeing any other people like we can nowadays. In those days, it took fifty people on a farm to do the work that two or three can do today, and villages like Tivetshall supported a vast range of trades and occupations. 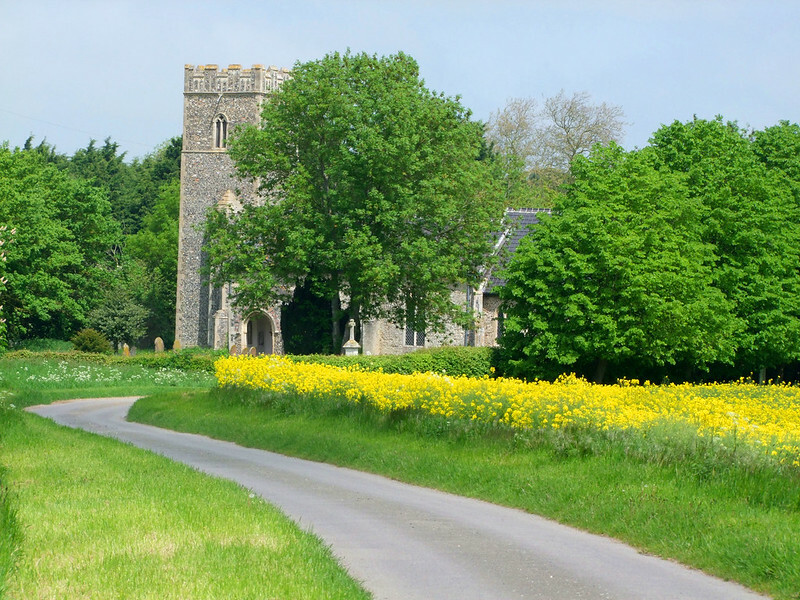 Norfolk villages were virtually self-sufficient, and had to be. The decline set in after the 1851 census, the population falling as young people set off to find prosperous new lives in the factories of Norwich and Ipswich. Today, the old order has gone forever, and the few farmers that remain struggle to make a living. The nearest shops are in Diss, and cars rule the lanes. But I'm still pleased that there aren't many of them. Perhaps symbolically of this new world, Tivetshall lost its other church, St Mary, to the sonic boom of a jet plane in the late 1940s. But the one that remains is an absolute jewel. 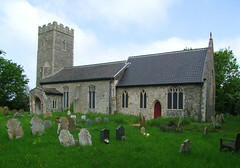 St Margaret sits out in the flat fields with only a farm for company, but its small, crowded graveyard is well-maintained, a blanket of emerald in this ploughed empty landscape. I came back here on one of those stiflingly hot days of which the summer of 2018 had so many. It was a relief after the straight miles from Gissing to get off my bike and wheel it into the shrouded churchyard. 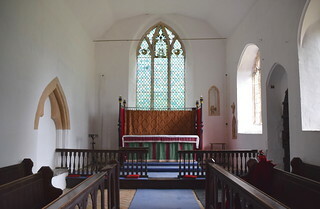 You approach the building from the east, and at first sight the chancel is curious. Its steeply pitched roof is higher than the western part of the church. Although it is basically early 14th century, despite the addition of later windows, it looks rather like a farmworker's cottage tacked to the east of the nave. The tower is broadly contemporary, which, as Pevsner points out, is also curious, for a major bequest for its rebuilding was made in 1456. The nave is clinically perpendicular with crisp windows, so perhaps they spent the money there instead. Certainly, the south doorway appears late medieval, and perhaps even later than the Reformation. This was about my half-dozenth visit, I suppose, and yet still with anticipation I stepped through the doorway into the small church. You can see at once that it is a remarkable place. On an earlier version of this account I described this as a ramshackle, cluttered and untidy church, delightfully so, and how much I admired it for that. I hoped that no one in the parish would have been offended by this, but in any case this church underwent a major restoration in the first decade of the 21st Century, and today feels crisp and loved, though still intensely rural, and perhaps even more delightful. It feels like a church of the common people. The stone floors and old woodwork of the nave set the tone, but what most people come to Tivetshall St Margaret to see is to the east of them. 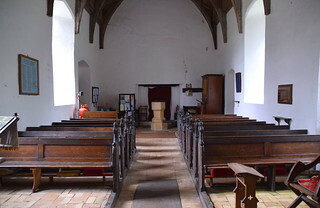 In early days, churches were essentially two separate rooms separated by a screen under a boarded tympanum. This is hard to imagine today, unless you come to somewhere like Tivetshall St Margaret, because here the chancel arch still retains its tympanum. 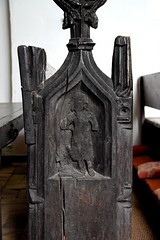 It is safe to say that almost all medieval churches once had one of these, but they were mostly removed at the Reformation because they displayed the rood, a depiction of the crucifixion which was proscribed by the Anglican reformers. 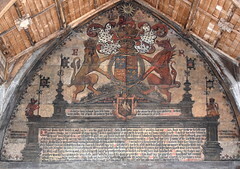 In a few places in Norfolk, however, these tympanum boards have survived, and as at nearby Kenninghall and at Ludham, the tympanum here was painted over in the second half of the 16th Century with the state Royal Arms. 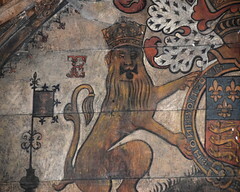 This had been a decree of Henry VIII, but no Henry VIII royal arms survive. So, the set for Elizabeth I at Tivetshall St Margaret is one of the earliest in England. 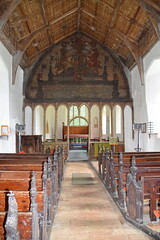 The boards stretch across the church, wall to wall and from the top of the roodscreen to the roof. 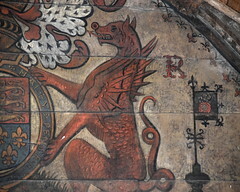 The lion and the dragon flank the vast Arms, with God Save Our Quene Elizabeth painted beneath, and a neat reminder of who was now in charge: Let every sowle submit hym selfe unto the authority of the hyer powers, for there is no power but of God, the powers that be are ordayned by God. The design includes the symbols of the other four Tudor monarchs, as well as the badge of Elizabeth's mother, Anne Boleyn. Beneath them, the Ten Commandments are rendered as a chunk of scriptural prose. There is certainly no finer set in England of this period. 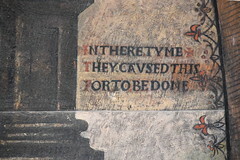 When I first saw this set about twenty years ago it was covered in dark varnish, but this was removed as part of the recent sensitive restoration, and they are now as vibrant and clear as when they were painted. 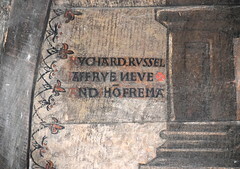 We even know which churchwardens were responsible for their construction and placement, for the date is given as 1587, and at the sides of the tympanum they are remembered: Rychard Russell, Jaffrey Neve and John Freman: In there tyme they caused this for to be done. 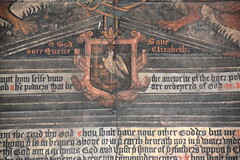 The screen below is painted in red and green, with gold stencilling and a shield depicting four magpies. 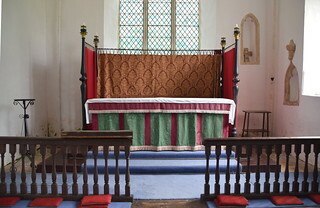 Beyond, the chancel fills with light, and a gorgeous red, green and gold English altar, echoing the rood dado panels, is surrounded by a Sarum screen. 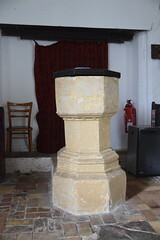 To the north of it is an Easter Sepulchre that dates from the original building of the chancel. 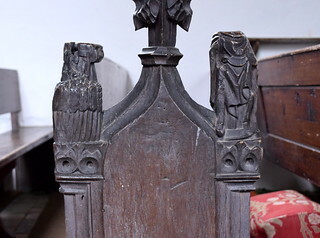 The church retains its medieval bench ends, which the Victorians would surely have itched to replace, they are in such rough condition. Perhaps this place was simply too poor and too remote for anyone important to notice. They are badly damaged, in most cases just the lower half of each figure surviving. 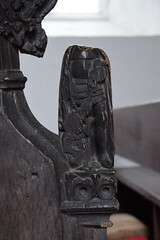 One has a small dragon cowering at the base, and has been recorded as St George, but I think the figure above has wings, and is probably St Michael. Perhaps the others are Saints too, and yet one figure has at its feet something that looks like nothing so much as a plough. Looking closely at the others, another figure appears to be standing among cornstalks, while yet anouther appears to be holding a harness. They could perhaps be Labours of the Months, and the remarkable thought dawns that these could have been depictions of 15th Century locals. Whatever, they must have been wonderful in their day. 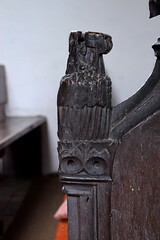 There are some earthy 17th century additions, presumably the work of a local carpenter. A small church, but one to spend time in. 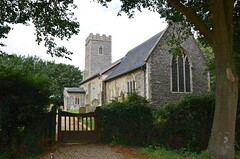 Here is the past hanging on, a touchstone with its thread of continuity, but also a glimpse of Norfolk just out of sight, no electricity, no water, no sound at all except the birdsong from the tree-bowered churchyard outside. Not much has happened here in the last century or so. into eternity, if only for a moment. This is a super church, absolutely packed with atmosphere and an intense sense of its rural past. A little treasure, a Norfolk delight.